Mason XC teams on a Roll! The Mason Men and Women put forth a great effort today to secure the District championship at Voice of America Park. The Comets men were first up in a blustery race that had all five of Mason scorers in the top 15. Zach Wills posted the fastest time on the day with a 15:34. Matt Kincaid put forth a valiant kick in the closing meters to pull ahead of St. Xavier’s Jack Butler and finish in 3rd place overall. Freshman Tom Clark (14th) put up a huge PR as the #5 Comet runner with a time of 16:39. Other Comets runners were Tate Honaker (10), Alex Notton (11) , Connor Van Blaricom and Ryan Sanders. Only 5 points separated Mason from St. Xavier with a team score of 39 to 44. The Lady Comets showed their strength today by defeating the second place finisher Kings with a score of 27 to 62. Monica Lake once again paced the race and snagged the win posting a 18:23. Mason was able to put 6 runners in the first 15 places as Monica was followed by Tori Martin (4th) , Jessica Harrison (5th) , McKenzie Jensen(8th) , Bridgett McElhenny(9th), Maddie Baehre and Katelyn Cain. The Comets will compete next Saturday at the Troy Regional. Race times will be posted on the website so try to come out and support the team! 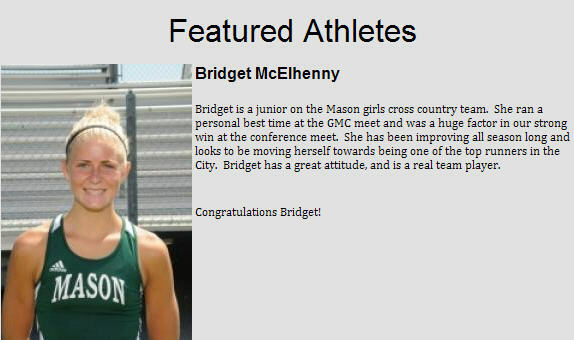 Our Featured Athletes on Masoncomets.Org! The Mason Comets took full advantage of the beautiful weather to completely sweep the GMC conference meet. It was the first GMC victory for both the Men’s and Women’s teams since joining the GMC. Coaches Chip Dobson and Tom Rapp were both named the GMC Coach of the year. 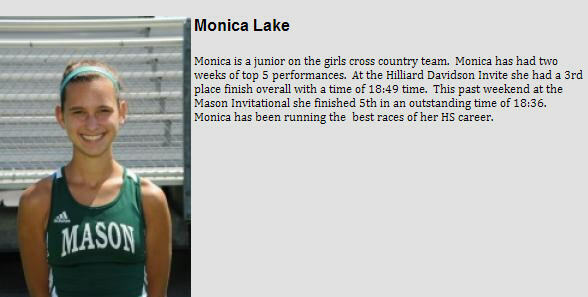 The Women’s team was lead by Monica Lake who also captured the Runner of the Year honors. Coach Dobson was beaming when the girls crossed the finish line knowing they had done well on the day. Rounding out the girls team were Tori Martin, Jessica Harrison, Bridgett McElhenny, McKenzie Jensen, Maddie Baehre and Katelyn Cain. Mason scored 43 points as a team followed by Sycamore with 67. The Comets Men had their best race of the season as a team, coming in with a team score of 37, followed by Oak Hills with 60 points. Zach Wills crossed in the finish line in first place for the Comets capturing the Runner of the Year honors. The top Mason men included Matt Kincaid, Alex Notton, Tate Honaker, Tom Clark, Ryan Sanders, and Connor Van Blaricom. Pictured above is Senior Tate Honaker. In the Open Race, the Comets proved just as dominating sweeping both team and individual titles again. In first for the lady Comets, was sophomore Jen Center. 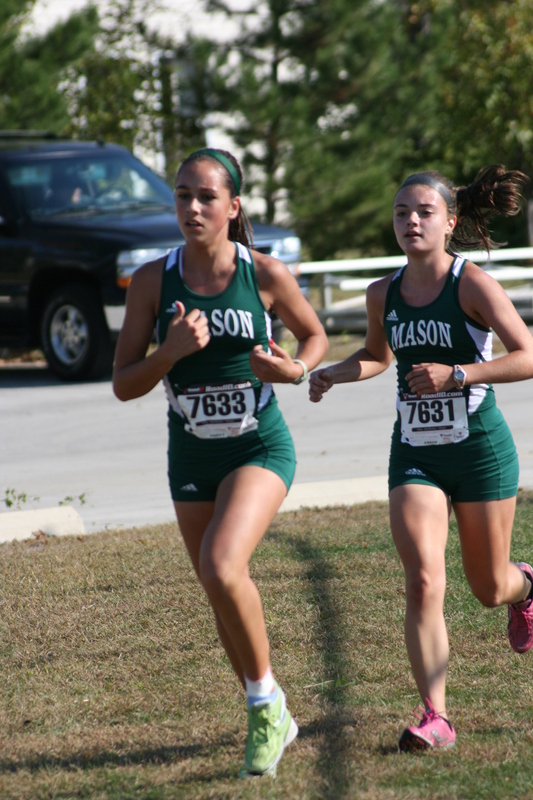 Rounding out the top finishers for Mason were: Ashley Calvani, Alyssa Ross, Marti Sumrall, and Lauren Wood. In the men’s open race, Tyler Phillips once again had a strong showing coming in first on the day. Just behind Phillips was freshman runner John Kincaid. Rounding out the top finishers for the men were: Steve Yates, Jordan Karim and Ryan Mumma. It was great to see that Mason Comet Runner Nick Whitmore was able to come to the meet and cheer on the team. We are so happy that Nick is continuing to improve from his injuries sustained at the Midwest Meet of Champions! The Comets will be in action for the District JV race this Thursday at Mason. The Varsity District race will be next Saturday at the Voice of America Park. The District race will be a qualifier for the OHSAA State Meet in November. Varsity is 3rd by 5 points! It turned out to be a perfect day to run! The Freshman/Sophmore girls showed us what that meant with a "Perfect Score - 15 pt" taking a team 1st place in the Freshman/Sophmore Race..."It's the sea of Green -Again!" was a comment over heard as our the 2 lead Mason runners came around the corner out of the tunnel. Leading the way for the Comets was Jen Center with a time of 19:40 - Following closely behind and breaking the "20" mark - Ashley Calvani with a PR of 19:53. #3 in the perfect race was Rachel Stein 20:17. Marti Sumrall was 4th 20:18 and Morgan Campbell 5th 20:25. The difference was only 2 points between Magnificat and Mason - this team race was so close that there was only 7 points difference in the first 4 team finishes. Mason ended in 3rd just behind Magnificat and 5 points behind Rockford - a team from Michigan. The Comets were lead by Monica Lake - 6th place 18:17 and Tori Martin - with a new PR and breaking "19" with an 18:50. 3rd place was Jessica Harrison 19:21, followed closely by Mackenzie Jensen 19:23, Bridget McElhenny 19:27, Kaitlyn Cain 19:48, and Maddy Baehre 20:22. Once again Mason Jr/Sr girls showed the rest of the field they were there to win! The Team captured first place with 27 points - second place was Sacred Heart Academy with 50! Brenna Hallum took charge running a very smart race - running shoulder to shoulder with a runner from Rockford up until the last field stretch where she kicked it in and left Rockford behind. Brenna's new PR 19:34. Meredith Touby and Alyssa Ross also ran an excellent race -Mer was 20:17 and Alyssa 20:20. Alyssa Zeltwanger was 4th 20:26 and Sydney Bauer 5th 20:55. Over 2,000 runners converged on Pine Hill Park but the Mason Comets volunteers kept the 36th Annual Mason Invite running smoothly. The Lady Comets ran an outstanding race in front of an enthusiastic home crowd. The lady Comets finished a strong second behind the nationally ranked Carmel High School from Indiana. The Varsity B team placed 7th in a field of 15 teams, including many of the top schools in the region. Monica Lake led the charge for the Comets, finishing 5th in an outstanding time of 18:36. She was followed by Jessica Harrison (13th) and Tori Martin (15th). Mackenzie Jensen (24th) and Caitlyn Cain (26th) were close behind, all covering the rugged 5K course in under 20:00, an outstanding accomplishment for each of the runners. The varsity lineups also included Ashley Calvani, Meredith Touby, Tori Blakeman, Alyssa Ross, Alyssa Zeltwanger, Kinsey Macbeath, Annemarie Lake, Jenn Center, and Bridget Barnes. The Mason men came out 3rd behind two very good Indiana schools. This was senior Zach Wills´ debut race of the season. He and Chris Walden of Carmel, IN battled for about 2 miles until Walden took the lead. Wills finished 2nd in 15:27. Mason was competitive in the last mile and that made the difference over local rival, LaSalle. Seniors Matt Kincaid (9th) and Tate Honaker (17th) ran very well, both finishing with their best times of the season (16:10 and 16:24, respectively). 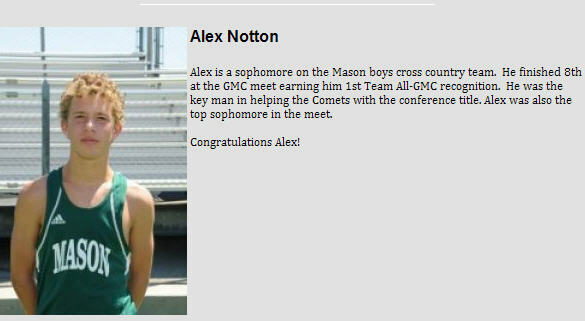 Rounding out the top five for Mason and also running personal best times were sophomore Alex Notton (28th in 16:46) and senior Kyle Lipton (30th in 16:49). Also running Varsity were Tom Clark, Brett Sanders, Ryan Sanders, Conner Van Blaricom, and Jordan Karim. Senior races looked strong. The top Mason finishers in each race were as follows. Thanks to all the volunteers our meet should be even bigger and better next year. Next up the Comets race at the Alliance Invitational on Saturday, Sept. 19th. Be part of the legacy…. Mason Invite - Sept 11th! The Mason Invite is this SATURDAY!!! We still need lots of help - attached are 2 notes from our RACE Coordinator - Joe Honaker. Please let use know if you have any questions.. thank you in advance for your support and dedication to the program!! We have the camera - we just need 1 more person to film from a single designated location. You may contact Kayla Wills directly if you are willing to help. Different tshirts will be for sale during the meet and they normally go quickly so get your tshirt early! Videos of the HS races will be for sale for $20 at the meet! A fully edited video will be mailed out in 3-4 weeks after the race to everyone that orders one. Here is the promo from last year's race if you would like to take a look at the course. Comets sizzleat Hot Summer Bash!! The women and men of the Mason Comets are showing early signs of both speed and depth as they ran to a 1st and 3rd place finish respectively at the Hilliard Bradley Hot Summer Bash. Under near perfect but windy conditions, the women’s team dominated the competition. The Comets were able to put nine runners under the top 26. Leading the pack for the Women’s Varsity team was Monica Lake with a 3rd place finish overall and a 18:49 time. Jessica Harrison, Tori Martin, McKenzie Jensen and Bridget McElhenny were the additional scorers in today’s race for the Comets who posted a low 37 points, outdistancing the nearest competitor by 31 points. Other runners for the Comets were Maddie Baehre, Ashley Calvani, Tori Blakeman, and Brenna Hallum. The Mason men (97) were lead by Senior Matt Kincaid. Kincaid posted a 16:12 on the day and came in 7th overall. Following Kincaid were Tate Honaker, Alex Notton, Tom Clark, and Kyle Lipton as the Mason scorers. The men showed great promise of things to come, as it was the first race of the season for many of the Comets and the first High School race for Tom Clark. Clark finished as the top freshman on the day. Other runners for the men were Connor Van Blaricom, Brett Sanders, Nick Whitmore, and Alex McGary. The men finished behind Medina (58) and Toledo St. John’s (82). Both JV and the Freshman/Sophomore races had a lot of Comet successes as well. Next up for the Comets is the Mason Invitational on our own home course September 11th. The Comets will host many of the best teams around the area and also teams will travel from Indiana for the meet. Come check out the teams next week at the Invite and support the Comets in action. In the Open race junior Jordan Karim came in second overall for the Comets with a 17:50 posting. He was followed by Eric Pfander, Kevin Fing, Sam Stieger and Matt Buchko.. Mason tied Trinity (KY) with 41 points. On the woman’s side top runners in the Open Race included Alyssa Ross who was first across the line in 20:40. Mason then took the 3rd through 9th spots with Meredity Touby, Alyssa Zeltwanger, Samantha Ipach, Gabby Montes, Sydney Bauer, Mili Patel, and Alex Perez. The Mason Comets scored 19 in the open race with the runner up Medina etching 63. Way to go Girls! Mason once again showed some depth placing only 3 points behind Medina. The Comet men were lead by freshman Ryan Sanders. Ethan Valentine, Ryan Lyons, William Chappell, Zac Thompson, Peter Bruns, and Steve Yates rounded out the top Comets in the race. On the woman’s side, it was a sea of green with Mason making up the majority of the field. Mason placed 15 of the top 20 runners. Top Mason runners in the Women’s 9-10 race were Jen Center, Katelyn Cain, Kinsey McBeath, Annmarie Lake, and Marti Sumrall.